No RAF units were based permanently at Crete until April 1941, but airfield construction had begun, radar sites built and stores delivered. Equipment was scarce in the Mediterranean and in the backwater of Crete. The British forces had seven commanders in seven months. In early April, airfields at Maleme and Heraklion and the landing strip at Rethymno on the north coast were ready and another strip at Pediada-Kastelli was nearly finished. After the German invasion of Greece, the role of the Crete garrison changed from the defence of a naval anchorage to preparing to repel an invasion. On 17 April, Group Captain George Beamish was appointed Senior Air Officer, Crete, taking over from a flight-lieutenant whose duties and instructions had been only vaguely defined. Beamish was ordered to prepare the reception of the Bristol Blenheim bombers of 30 and 203 Squadrons from Egypt and the remaining fighter aircraft from Greece, to cover the evacuation of W Force, which enabled the transfer of 25,000 British and Dominion troops to the island, preparatory to their relief by fresh troops from Egypt. The navy tried to deliver 27,000 long tons (27,000 t) of supplies from 1–20 May 1941, but Luftwaffe attacks forced most ships to turn back, and only 2,700 long tons (2,700 t) were delivered. 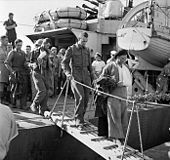 Only about 3,500 trained British and Greek soldiers were on the island, and the defence devolved to the shaken and poorly equipped troops from Greece, assisted by the last fighters of 33, 80 and 112 Squadrons and a squadron of the Fleet Air Arm, once the Blenheims were ordered back to Egypt. In mid-May, the four squadrons had about two dozen aircraft, of which only about twelve were serviceable due to a lack of tools and spares. The unfinished ground at Pediada-Kastelli was blocked with trenches and heaps of soil and all but narrow flight paths were blocked at Heraklion and Rethymno by barrels full of earth. 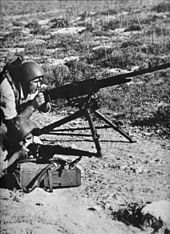 At Maleme, blast pens were built for the aircraft, and barrels full of petrol were kept ready to be ignited by machine-gun fire. Around each ground, a few field guns, anti-aircraft guns, two infantry tanks and two or three light tanks were sited. The three areas were made into independent sectors, but there were only eight QF 3-inch and twenty Bofors 40 mm anti-aircraft guns. Hitler authorised Unternehmen Merkur (named after the swift Roman god Mercury) with Directive 28; the forces used were to come from airborne and air units already in the area and units intended for Unternehmen Barbarossa were to conclude operations before the end of May, Barbarossa was not to be delayed by the attack on Crete, which had to begin soon or would be cancelled. 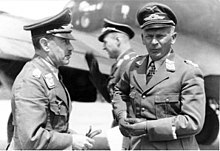 Planning was rushed and much of Unternehmen Merkur was improvised, including the use of troops who were not trained for airborne assaults. 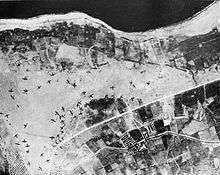 The Germans planned to capture Maleme, but there was debate over the concentration of forces there and the number to be deployed against other objectives, such as the smaller airfields at Heraklion and Rethymno. 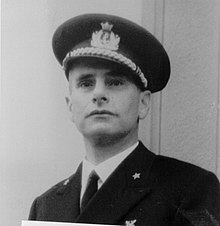 The Luftwaffe commander, Colonel General Alexander Löhr, and the Kriegsmarine commander, Admiral Karl-Georg Schuster, wanted more emphasis on Maleme, to achieve overwhelming superiority of force. Major-General Kurt von Student wanted to disperse the paratroops more, to maximise the effect of surprise. As the primary objective, Maleme offered several advantages: it was the largest airfield and big enough for heavy transport aircraft, it was close enough to the mainland for air cover from land-based Messerschmitt Bf 109 fighters and it was near the north coast, so seaborne reinforcements could be brought up quickly. A compromise plan by Hermann Göring was agreed, and in the final draft, Maleme was to be captured first, while not ignoring the other objectives. The defending force organised for a night counter-attack on Maleme by two New Zealand battalions, the 20th Battalion of the 4th Brigade and the 28th Maori Battalion of the 5th Brigade. A New Zealand officer present at the battle claimed a long delay ordering the planned counter-attack turned a night attack into a day attack, which led to its failure. Fears of a sea landing meant that a number of units that could have taken part in the attack were left in place, although this possibility was removed by the Royal Navy which arrived too late for the plans to be changed. 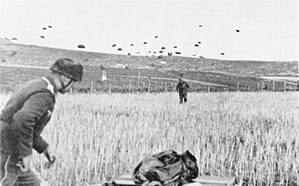 The delayed counter-attack on the airfield came in daylight on 22 May, when the troops faced Stuka dive bombers, dug-in paratroops and mountain troops. 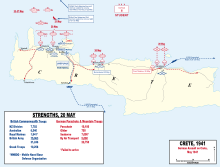 The attack slowly petered out and failed to retake the airfield, which forced the defenders into withdrawals to the eastern end of the island, to avoid being out-flanked. b From 20 May to 2 June: 4 Cruisers, 8 Destroyers, 2 Minesweepers, 5 Motor torpedo boats were sunk and 3 Battleships, 1 Aircraft Carrier, 7 Cruisers, 9 Destroyers and 2 assault ships were damaged. c Between 13 May to 1 June, 147 in combat, 73 non-combat, 64 written-off and 125 damaged. ^ a b c d e f Daniel M. Davin (1953). "The Official History of New Zealand in the Second World War 1939–1945". Victoria University of Wellington. p. 480. Retrieved 22 November 2018. 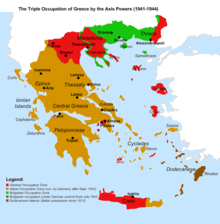 ^ a b "How British Bungling Lost the Battle for Crete in WWII". www.thenationalherald.com. ^ a b "British Vessels Lost at Sea, 1935-45". Naval History. 1947. Retrieved 22 November 2018. ^ "The Historical Combat Effectiveness of Lighter-Weight Armored Forces" (PDF). The Dupuy Institute. 2001. p. 84. Retrieved 19 November 2018. 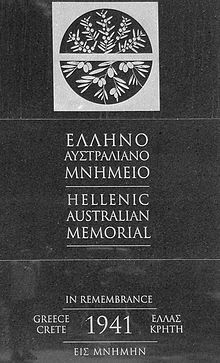 ^ "The controversies – The Battle for Crete | NZHistory, New Zealand history online". www.nzhistory.net.nz. Retrieved 24 November 2015. ^ Handel, Michael I. (2013) . "Intelligence and Military Operations". In Handel, Michael (ed.). Intelligence and Military Operations. Studies in Intelligence. Abingdon, Oxfordshire: Routledge. p. 47. ISBN 9781135179342. Retrieved 23 July 2018. It appears that General Freyberg was introduced to Ultra only shortly before the battle of Crete began and therefore had no time to become familiar with its proper interpretation. This situation was exacerbated by the fact that 'he was forbidden to show it (the information derived from Ultra) to anyone or to discuss it with his intelligence staff.' [...] Moreover, tight security regulations prohibiting him from taking action on the basis of uncorroborated Ultra evidence limited its value. ^ David A. Thomas (1972). "The Naval Battle for Crete". National Museum of the Royal New Zealand Navy. Retrieved 20 December 2018. Playfair, Major-General I.S.O. ; Flynn, Captain F.C. ; Molony, Brigadier C.J.C. & Toomer, Air Vice-Marshal S.E. (2004) [1st. pub. HMSO 1956]. Butler, J.R.M (ed.). The Mediterranean and Middle East: The Germans come to the help of their Ally (1941). History of the Second World War, United Kingdom Military Series. II. Naval & Military Press. ISBN 1-84574-066-1. Roskill, S. W. (1957) . Butler, J. R. M (ed.). War at Sea. History of the Second World War United Kingdom Military Series. I (4th impr. ed.). London: HMSO. OCLC 881709135. Retrieved 4 November 2015. Harokopos, George (1993). Spilios Menounos (ed.). The Fortress Crete 1941–1944 The Secret War 1941–1944: Espionage and Counter-Espionage in Occupied Crete. English translation: B. Giannikos (Greek paperback ed.). Seagull. ISBN 960-7296-35-4. Kokonas M. D., N. A. (1993). Leigh Fermor, P. (ed.). The Cretan Resistance 1941–1945: The Official British Report of 1945 Together with Comments by British Officers who took part in the Resistance (Greek pbk ed.). London. ISBN 960-85329-0-6. Psychoundakis, George (1991) . Patrick Leigh Fermor (ed.). The Cretan Runner: His History of the German Occupation (Greek pbk. ed.). London. ISBN 960-226-013-0.